It’s amazing how you only need a small change and can totally revolutionise the way a room looks. Adding new blinds will do this. Blinds will look stylish and contemporary and suit all kinds of homes. Whether you go for the modern look, country cottage, or have more vintage, eclectic tastes there are blind styles out there to suit you all! The simplicity in the rest of the decor really allows the pattern on the blind to stand out and be the focal point of the room. The colours compliment the scheme making it calming and restful. I love the way this blind below is also the focal point of the room! Well it couldn’t really be anything else could it? I think this is a great idea and fantastic for families and travellers alike. But you don’t always have to go for pattern and print; plain and simple works just as well and can create just as much of an impact. Take this room with its amazing view. You wouldn’t want to add fussy blinds and lots of pattern and print to a view like this would you? So the simple white slatted blinds work really well in this case. At night you’d be able to close them and keep the room cosy, whilst in the daytime they create a frame to this amazing view. So what styles are out there and what should you go for? For contemporary homes try either roller, slatted or roman blinds. Keep the lines simple and clean. Try shutters for more of a country cottage look, or even try roman blinds made from co-ordinating patterned fabrics. For the more traditional home, again roman blinds work well as do vertical blinds. If you’re looking for warmth and comfort you can also team your blinds with voluminous curtains that really create the wow factor! Don’t be afraid to give things a go. Some styles of blinds can be more expensive than others particularly if you’re having them made to measure but there are still places where you can get cheap home vertical blinds, as well as inexpensive roller and roman blinds too. IKEA is a great place to start, but also try John Lewis and high street stores like Next. As ever a good hunt around on the internet will serve you well. And so this leads me onto the benefits of whether to go home made or shop bought. Blinds can be home-made – I should know I’ve made several roman blinds for my own home over the years (with the help of my Mum and her trusty sewing machine!) and they’ve been fabulous. The benefit of course, is that you get exactly what you want at half the price of a made to measure version. So if you do have the skill, or fancy giving it a go, it’s well worth the effort. There are lots of tutorials out there. Through Pinterest I’ve found this one here that has lots of images and tips along the way – do let me know if you give it a go. I’d love to look at more of these ideas in detail. Is this something you’d like to see me covering? 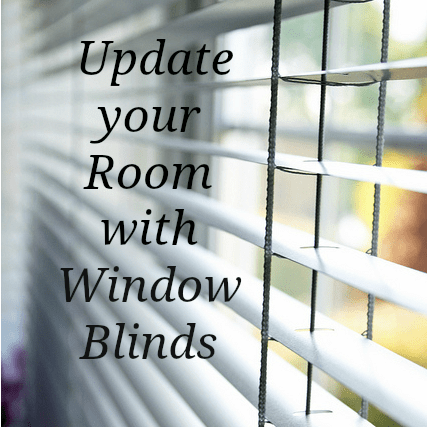 Would you like more information and ideas on how to co-ordinate blinds with the rest of your room? Would you like to see the current trends in window dressings? Can I show you where to go and shop to get the best deals currently? Do let me know if you’d like any of these ideas in the comments below. Previous Post Make your Living Room more Liveable!